This card was created for a new friend I met in Wichita. Hi Carla! I wanted to send her a special thank you card for the hospitality and gifts she gave us during our short stay in her hometown. I like to make shaker cards when I want a fancy effect but they are often too tedious. The Sizzix die set that I used takes away much of the hard work. First I used the largest square frame to cut the card base....just put the top edge of the die beyond the fold of the Kaiser Crafts card stock so the top fold will remain intact, forming the card. I used the largest circle to cut a piece of acetate to glue behind the front window. The neat part of this die set is that it comes with a small piece that forms the channel for enclosing the sequins. (Use double stick tape to fasten several pieces behind the window to go all around the inner square.) Put the sequin flowers from Eva's (Crafting This and That blog) Etsy site and my stash of Flower Soft down inside first before sealing them in with the upper windowed piece. 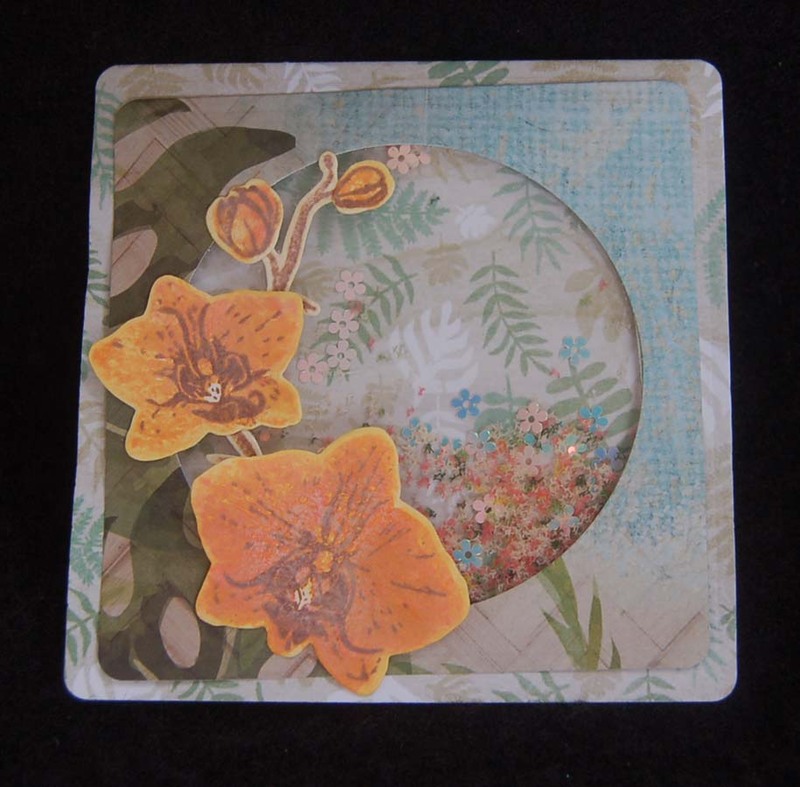 The orchids were simply made with the Hero Arts stamp and die sets on watercolor paper using Distress Oxide Inks. The circle that was cut out from the front of the card was heat embossed with gold powder (NUVO) using a Taj 'mahalo' stamp. 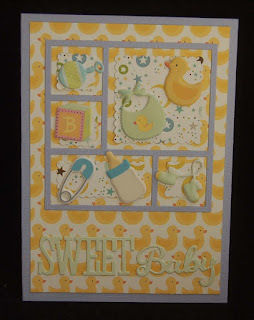 I think this card was successful because the Kaiser Crafts 12x12 sheet (purchased at HM Ben Franklin Crafts) had front and back designs which coordinated well with each other. 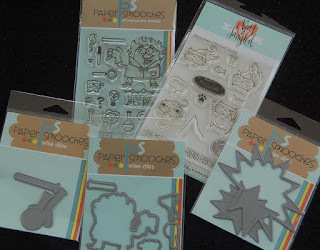 The Sizzix die set (from HM BFC) really made forming the shaker card a snap and assures that I will be making more in the future. Thanks for stopping by! Hope you'll visit again soon to see what other creations I whip up. Please leave a comment if you have time to spare...love hearing from you! I think unicorns are making a come back from the 70's. This makes me happy....love rainbows, hearts and unicorns. I guess I'm still a little girl in spirit. Avery Elle has a delightful unicorn stamp set and matching die set which when paired with Doodlebug Designs 12x12 magical unicorns double sided card stock made this fantasy step card. 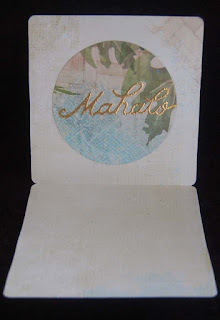 This side view shows the folds of the step card that was easily die cut using the Sizzix die shown in a previous post. The unicorn print on the card stock was so pretty I didn't want to cover it up. 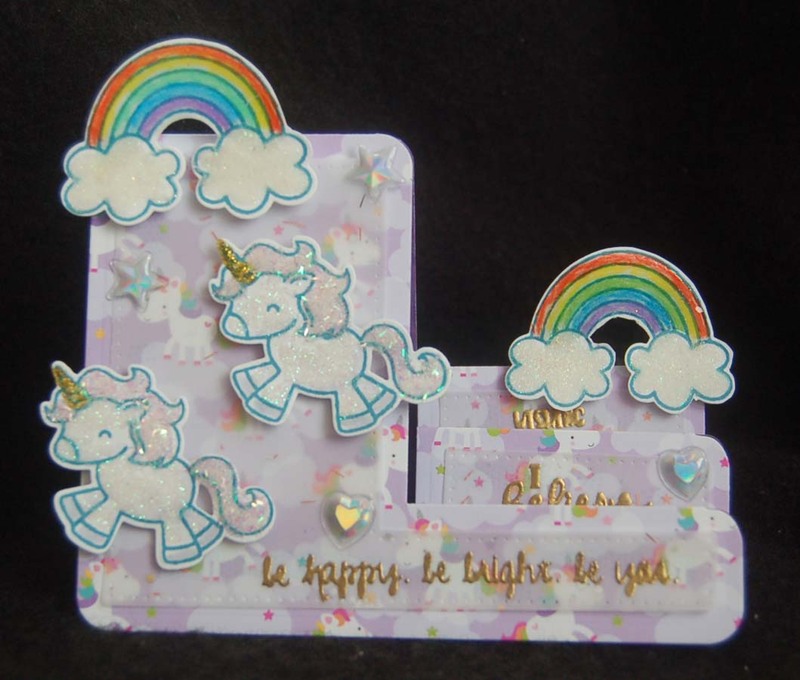 I chose to cut the inner panels from gold flecked vellum so the design shows but makes a softer background for the unicorns and rainbows. 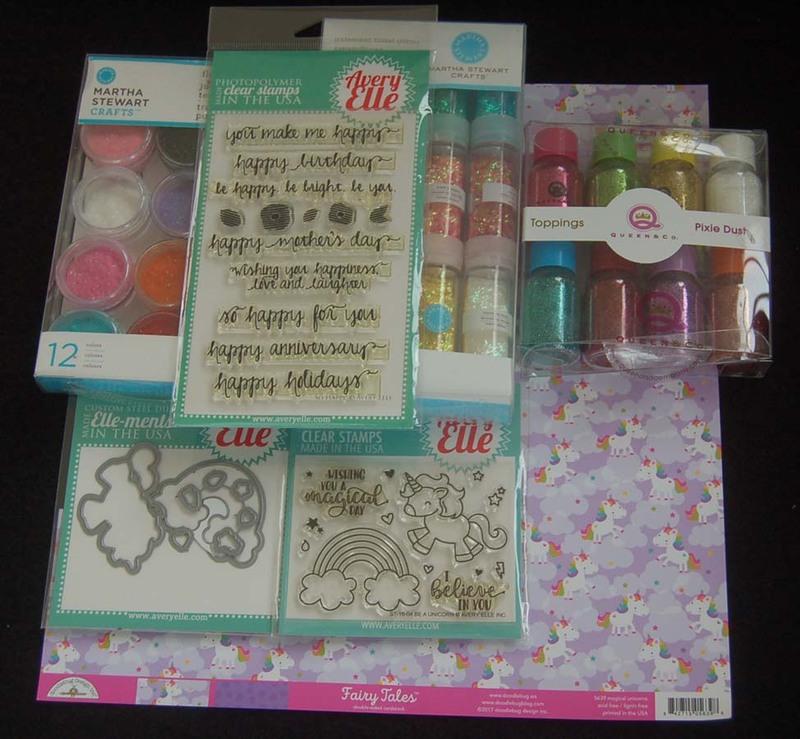 The sentiments from the Avery Elle stamp sets were stamped in gold and heat embossed with NUVO gold embossing powder (available at HM Ben Franklin Crafts). 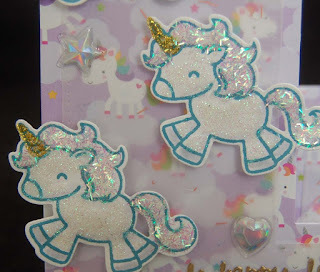 Here is a close up of the glittered unicorns. 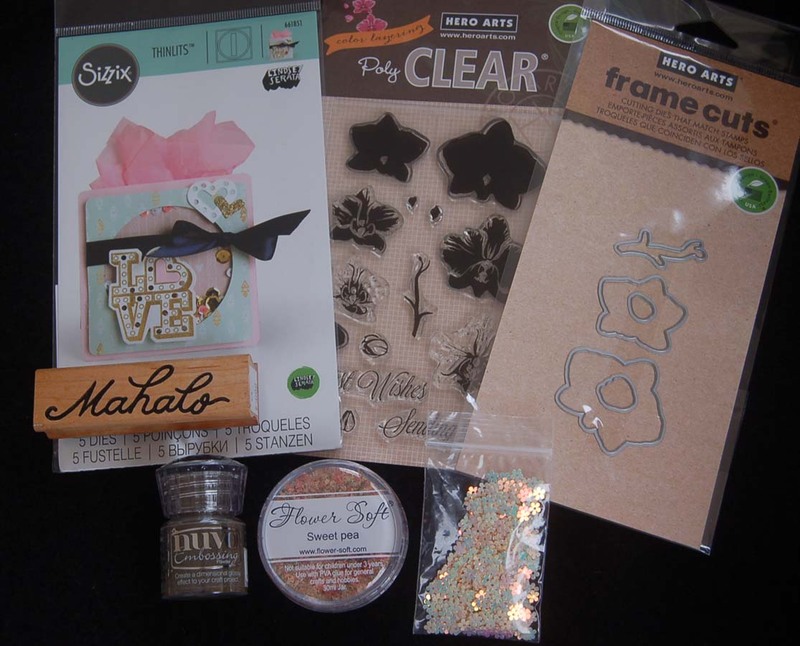 I used Glossy Accents (Ranger) as the adhesive for the Martha Stewart (tinsel) and Queen & Co (pixie dust) glitters. The clouds were decorated with MS glitter flocking but sadly the photos don't show this textured effect. The rainbows were colored with Prismacolor pencils (form HM Ben Franklin Crafts) and then covered over with Glossy accents before die cutting. I hope that this card made you smile and remember the sweet days of your youth. Let's encourage a new generation to believe in beautiful, magical images. Craft some smiles today! 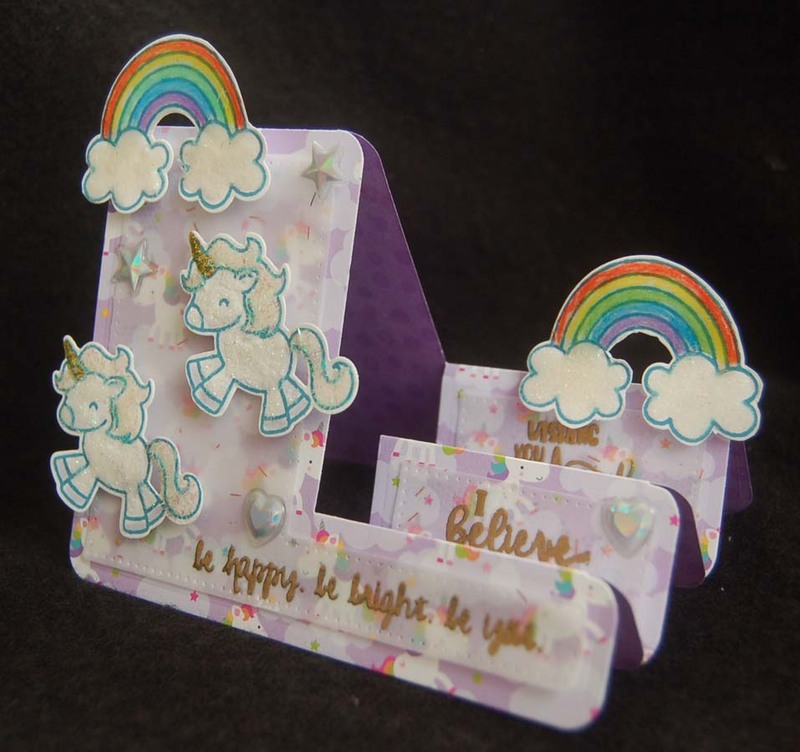 As promised in my last post, here is another version of the step card made with the Sizzix die set. 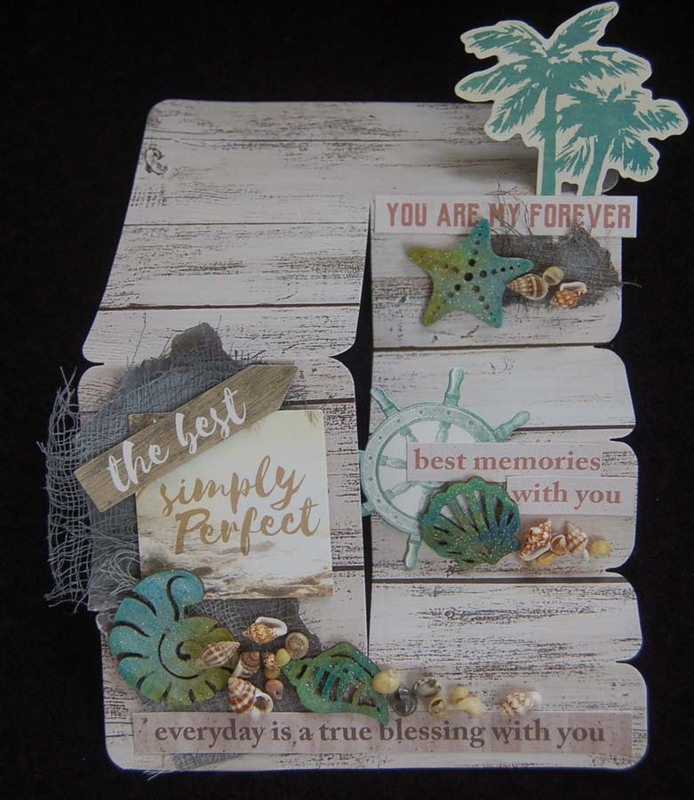 This time I was going for an island vacation feel with romantic undertones (suitable for an anniversary card but not girly). 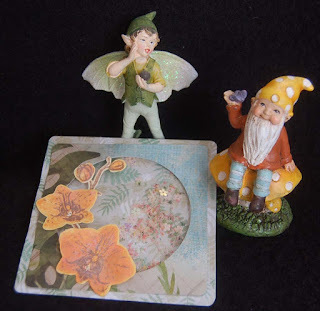 The base was cut from a 12x12 sheet from the Sage and Grace cardstock pack. This Kaiser Crafts pack (purchased from HM Ben Franklin Crafts) contains both rustic and floral designs which makes it very versatile. 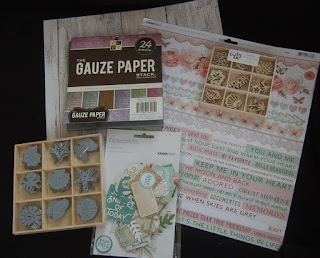 It was super easy to glue on torn bits of gauze paper (DCWV pack) smudged with a bit of gesso and add die cuts from the Kaiser Crafts Island Escape die cut package. To further enhance the tropical look I stained some shell shaped wooden pieces (Sierra Pacific and Kaiser Crafts) and used Glossy Accents (Ranger) to glue on fine crystal glitter. 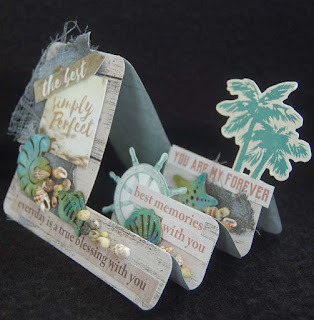 Tiny genuine shells added a realistic touch of the seaside without overly weighing down the card. 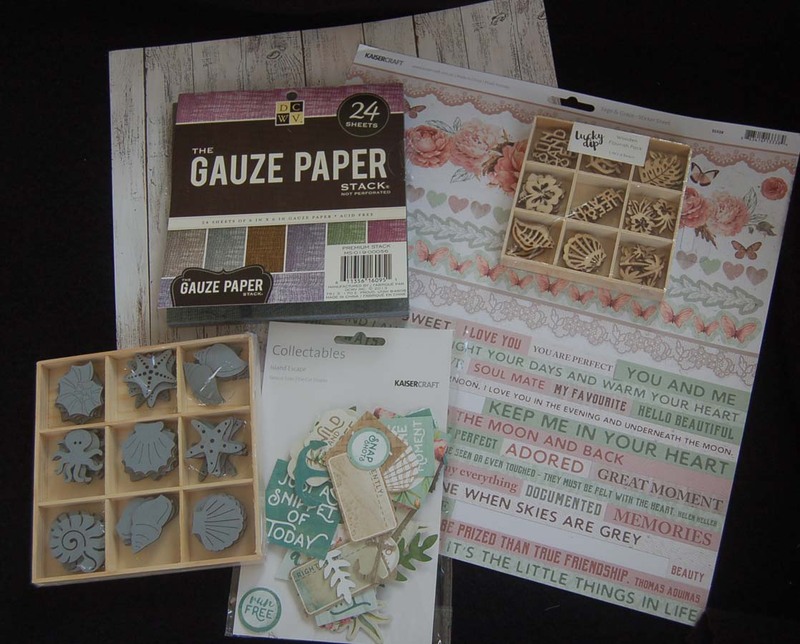 Finally, I added the sentiments stickers that came from the 12x12 papcket of Sage and Grace (Kaiser Crafts) papers. 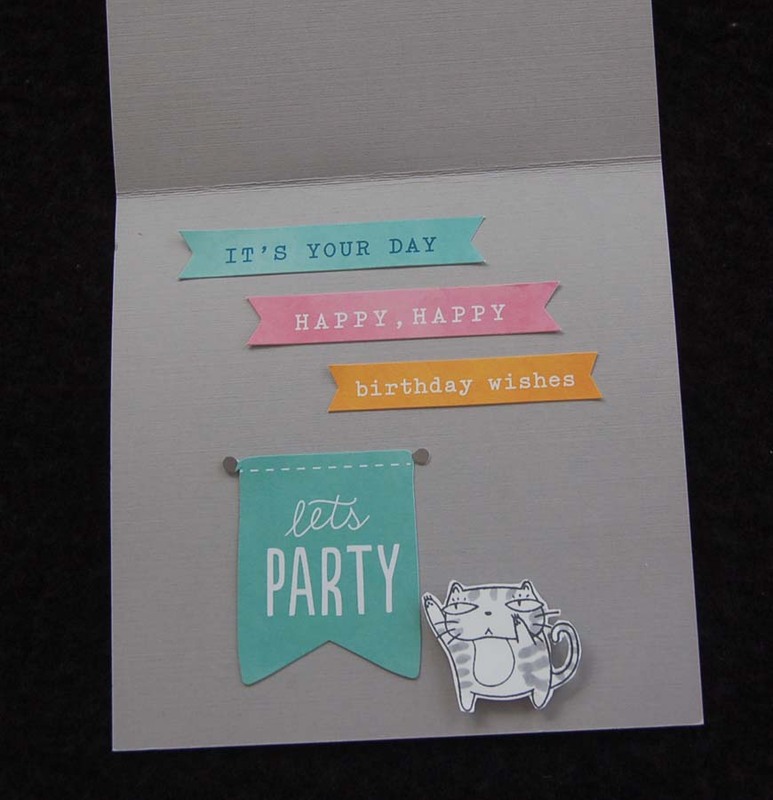 I like this view of the card (slightly opened) because all the embellishments can be viewed. It was so easy and fun to make this step card; I think I will make another one with a unicorn theme!!!!!!! I've made step cards before but they always seemed to require too much measuring, cutting and folding. The Sizzix die set, Step-Ups (from HM Ben Franklin Crafts), makes it easy to cut out a step card with one simple roll of your die cutting machine. 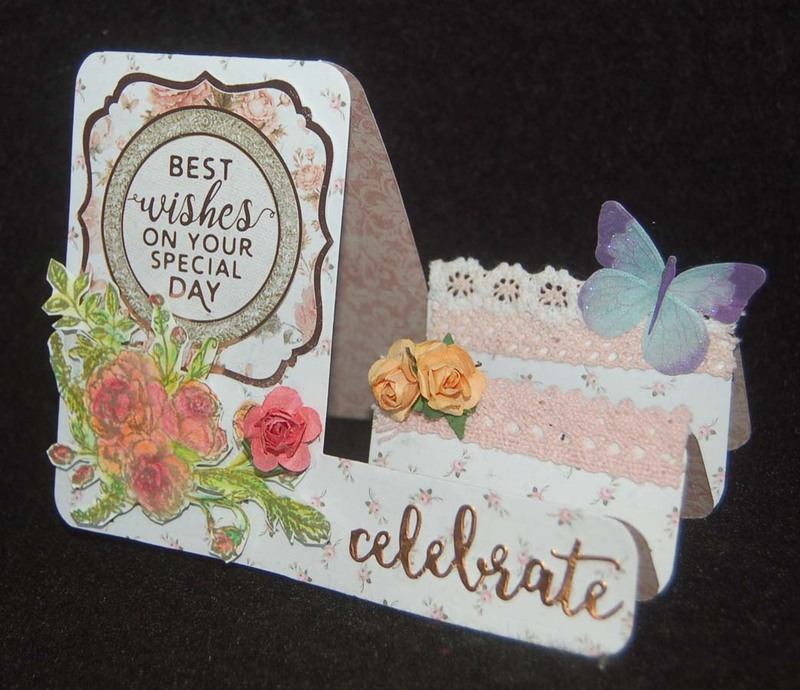 Once I cut out the base from Kaiser Craft 12x12 card stock (Sage and Grace) (card stock 12x12 packet from BFC), I easily folded it and added the embellishments including a Jolee's Boutique vellum butterfly, paper roses and lace. Also from Kaiser Crafts is a Sage and Grace stamp set (sold at BFC) which I used to make the floral bouquet (stamped with green Momento ink and colored in with watercolor pencils). 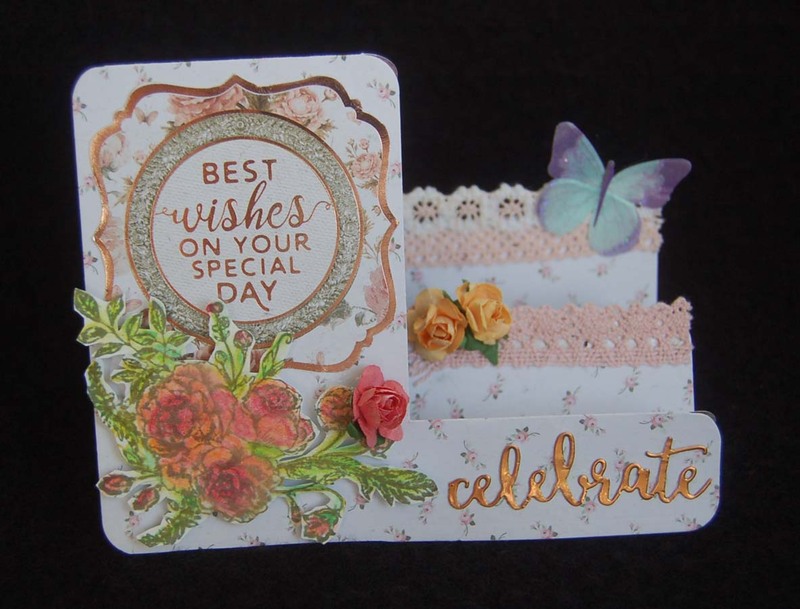 The sentiment badge came from the 6-1/2 x 6-1/2 Kaiser Crafts paper pad (purchased at HM BFC) and an Avery Elle word die was used to cut the 'celebrate' from copper colored foil. 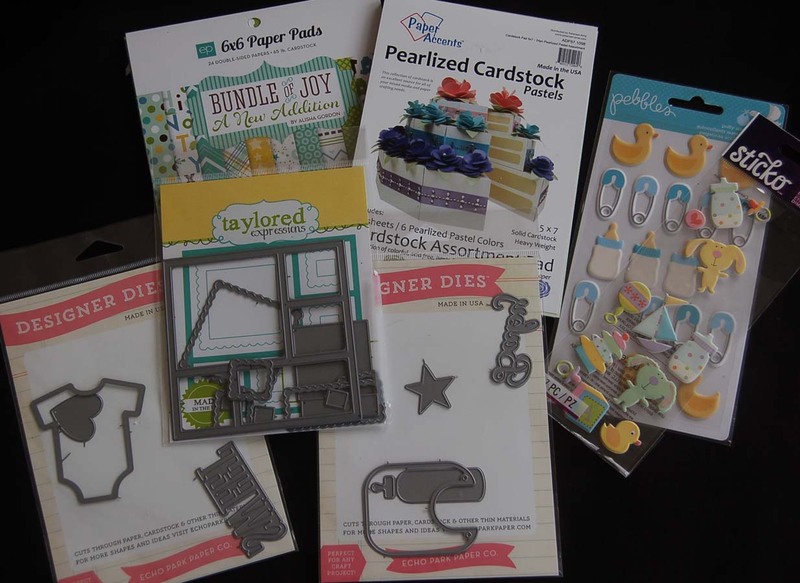 The Sizzix step die card has so many possibilities that I think I'll use it again for my next card. I think you'll be surprised how easy it is to totally change up the look. Visit this site again to see my next step card and please leave a comment if you have some time to spare....love hearing from you! While I still had my baby themed supplies out I decided to make a gift tag that could also double as a doorknob sign for the baby room. It was simple work to die cut three hangers using the Avery Elle Cheers die set (actually used for making wine bottle tags). I cut three pieces (front print, back print and middle solid blue color) to make the hanger sturdier. 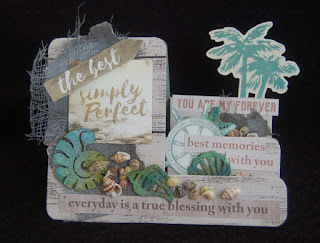 Next I stamped the sentiment and heat embossed it with blue Nuvo embossing powder. The cloud and moon were also stamped and embossed before die cutting with the items from the Echo Park Goodnight Moon die and stamp set (from HM Ben Franklin Crafts). 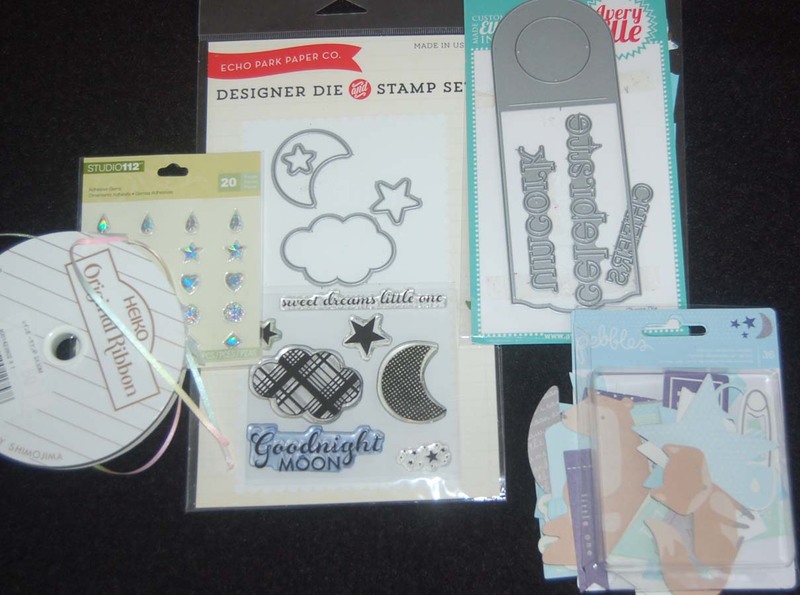 The pieces were adhered to the hanger with foam stickies and Studio G star stickers were added. 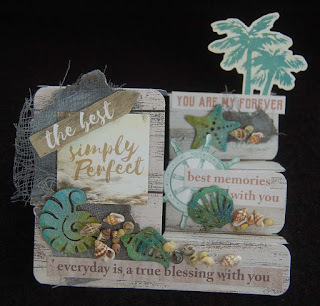 An oval sentiment die cut from the Pebbles cardstock set (from BFC) was glued onto the back of the sign. For a final touch a hole was punched at the bottom of the hanger and Heiko ribbons (sold at Celebrations) were tied on. Oh yes, don't forget to cut through the ring so the sign can be hung on the doorknob of the baby's room/used for a tag on the baby gift. I am pleased that this tag was so easy to make and has a double duty as a sign for the baby's room. This is probably one tag which won't be thrown away...YAY!!!! 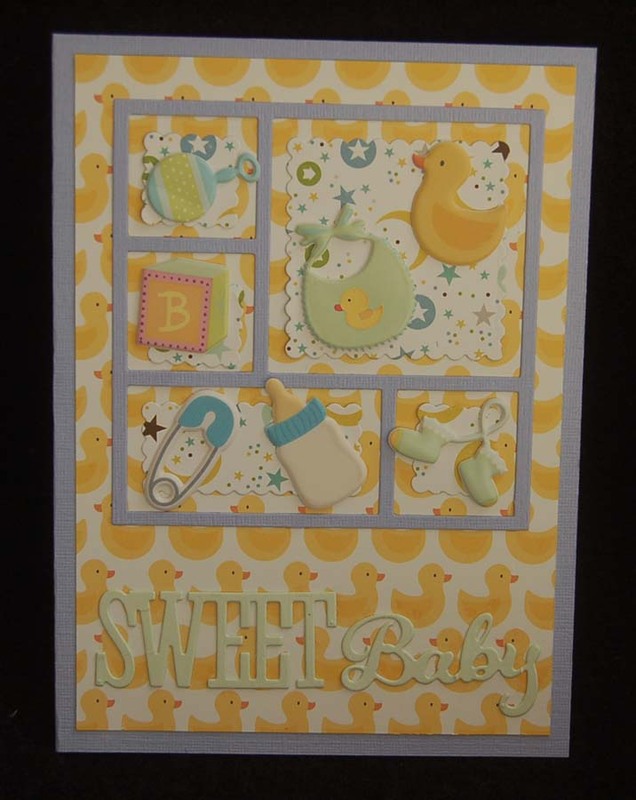 As soon as I saw the Pebbles 'duckie' cardstock at HM Ben Franklin Crafts, I knew that it would make a really cute baby card for a baby boy soon to be born. Since I was at HM Ben Franklin Crafts, I chose some matching Pebbles puffy stickers and another sheet of puffy Sticko stickers. With the Taylored Expressions and Echo Park die sets, it was easy to cut out the frame from blue card stock and the words from pearlized cardstock (Paper Accents). To add a little color behind the stickers I added die cut printed paper from an Echo Park cardstock pad. I used double stick Heiko tape to adhere the larger pieces and on the tiny strips of the frame I used Glossy Accents. (This is actually not a glue but works well on small pieces because of the small nozzle on the applicator. Tip: If there are shiny spots after the solution dries, just apply some cornstarch.) This card came together very quickly and yet it looks like I spent a lot of time constructing it. Keeping cards simple is my new mantra because so many recipients don't even notice that they are handmade. 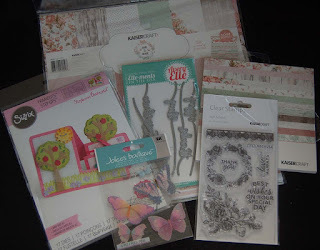 Do my lovingly made cards get thrown away with the wrapping paper??????? As you can see, I am still playing with my new dyes, inks and powders. (See previous posts. )This background paper seemed perfect for the birthday card I've been planning for my scientist son who owns two lovable striped cats. 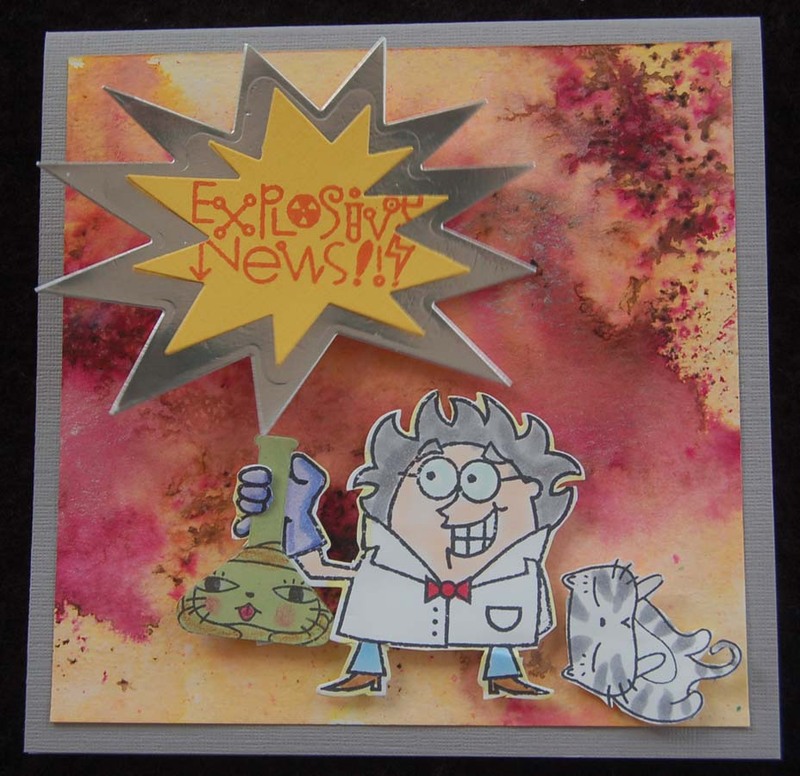 I love the expression on the face of the Paper Smooches scientist rubber stamp image. The Neat and Tangled cat images never fail to make me smile. 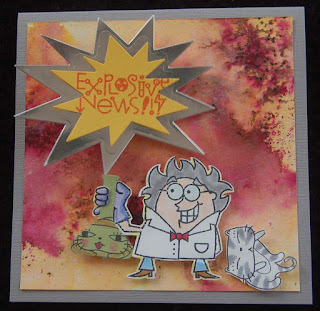 Do you think the cat on the front of the card fainted because he saw the cat in the flask? I put the explosion sign on a wobble gizmo from Art Impressions so that it vibrates when shaken....hard to capture that in a photo. By using foil on the sign, it flashes and seems more like the words are exploding. All the other parts are on sticky foam squares, The flask was cut twice....once in green paper and once in clear acetate so when assembled it looks like a glass flask....difficult to see in the photo. For the inside of the card, I decided to use some birthday die cut words that I had stored (hoarded) in my box of 'birthday' stuff. Is the other cat dancing ? I think my son will find the humor in this birthday card because he is wacky just like his mom. LOL!